I don't often do this. In fact, I can't think of a time I have EVER done this, but I want to re-highlight a book. I read this book back in May and in my review I said it was a masterpiece. I want to repeat that IT IS A MASTERPIECE. Don't believe me? Well, it's now been 5 months since I read it, but tonight I met the author and as soon as she said hello to me I unexpectedly BURST INTO TEARS and began to blubber about how "It's one of the best books I've ever read. I never thought I'd ever get to meet you." Then she stood up and hugged me. I seriously wasn't feeling emotional at all until she spoke to me and then all the emotions I felt while reading this book came RUSHING back. GAH! It is SOOOO good! Don't let the phonetic writing or lack of quotation marks throw you off. Please. Give it a chance. And here's the picture of me and Moira. Edited, of course, to hide my face. I'm very excited to read this now. Wow, so many of you all loved it so much! And wait? This looks like a "normal" picture! I guess you get to have an unedited copy for your personal files? :) Awesome! Ha! Suey, I usually take "normal" pictures when I know I'm the only one who will be able to distribute it. Anyhoo, I REALLY want this book. Whenever I pass by a bookstore, it calls out to me to buy it! It's so painful. I keep reading so many wonderful things about it...I really need to read it soon. I really need to read this soon its on my shelf too! BUT I did love this post! I very rarely comment on author signing type posts, but this one is most awesome! I loved this book too! I was only able to get to this book recently - I reviewed it on Monday.. oh my gosh, I wasn't crazy about it! I did like it, but it wasn't one of my favs. I think my expectations were just really blown out of proportion. :P It's really cool you got to meet the author! I've read some interviews with her and she seems pretty interesting. I really have a deep desire to get this book. I can't wait!! 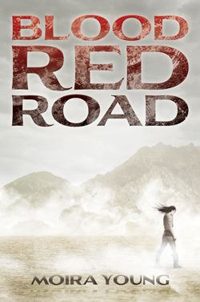 I couldn't agree more, and I only listened to the audiobook of Blood Red Road, this book is phenomenal. Definitely on of the best books of the year for me. Aw! I bet you made her MONTH! Just found you on Goodreads, I'll friend you there soon. :) Cute pic, although the book over the face kinda made me snort! Isn't it the BESTEST book ever!? Seriously, I totally agree. 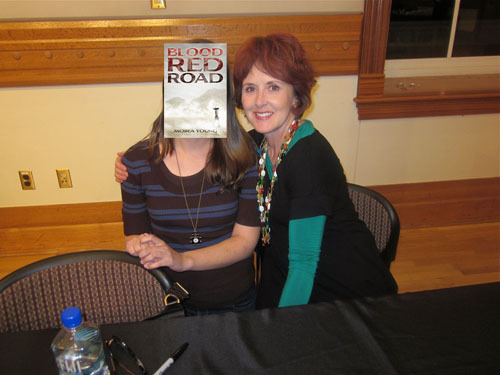 You're so lucky to get to meet Moira Young!